Atlanta Regional Commission is the regional planning agency for the 10-county Atlanta region. In short, ARC helps to focus the region’s attention and resources on critical issues. ARC’s Civic Dinners give metro Atlanta residents the opportunity to sit down together and break bread while having focused, meaningful conversations about issues that matter. Civic Dinners are meant to be fun, and they’re designed to break down barriers. They’re also critically important. Your input will help ARC and all our regional partners understand what matters to real metro Atlantans as we begin the work of updating The Atlanta Region's Plan, our blueprint for the future of metro Atlanta. One person chooses to host a meal with a diverse group of six to 10 people – friends, colleagues, neighbors, or people you just want to get to know better. We recommend stepping outside your social circle for a more productive experience. Hosts invite guests to sign up online. The Atlanta region will add 2.5 million people by 2040. How we get around, by car, train, bus, bike or our own two feet will impact our collective quality of life. It's time to come together and have a real conversation about the future of mobility in the Atlanta region. This conversation explores how everyone in the Atlanta area can gain access to affordable housing. Affordable housing creates a solid foundation for people's lives, allowing them to build community connections, pursue training in education, seek well-paying jobs and develop healthy lifestyles. It also ensures metro Atlanta remains successful and competitive in the decades to come. The Atlanta region is a dynamic place, with a rapidly growing population that is getting older and more diverse. Residents of all ages and abilities are demanding a better quality of life. They’re seeking vibrant, walkable communities, greater access to parks and greenspace and improved housing options. As the world changes, the Atlanta region must invest in its people to develop a highly educated workforce to meet the needs of 21st century employers. 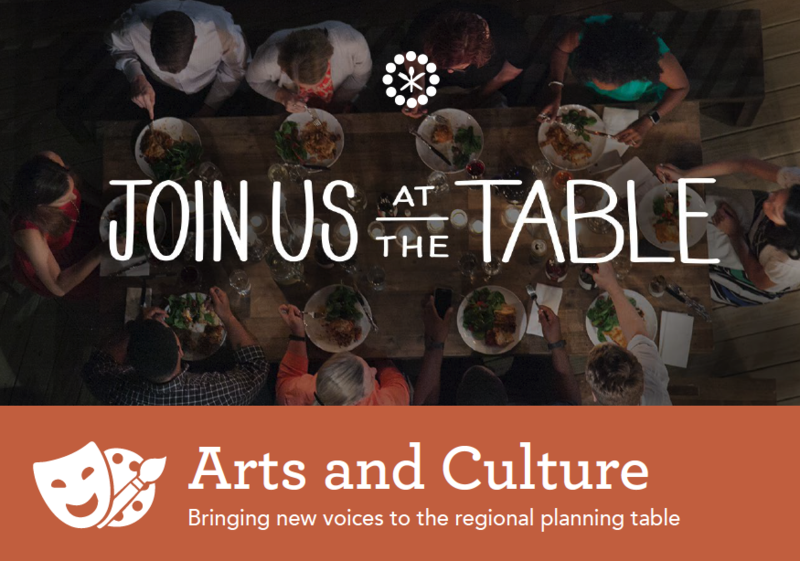 Join us at the table for a conversation about economic prosperity and inclusion for all. The Atlanta region is one of the fastest growing job markets in the country, fueled by a highly educated workforce and a relatively low cost of living. But too many people in our community are either unemployed or underemployed. At the same time, employers struggle to fill job openings with qualified workers. This discussion is about how to get everyone in the Atlanta region on the road to a productive career. This conversation explores how we define sustainability – and how we can protect the natural resources we need now and in the future. This conversation explores how we enjoy and support arts and culture – and how arts and culture can improve our community. YOU are amazing! Thank you for diving in and helping ARC and all our regional partners understand what matters to real metro Atlantans as we begin the work of updating The Atlanta Region's Plan, the blueprint for the future of metro Atlanta. We've created copy/paste messaging to help recruit attendees at your dinner. I'm hosting a Civic Dinner on behalf of [TAG @AtlantaRegionalCommission]! Join me [insert date and time] for a night of meaningful and important conversations exploring what matters to real metro Atlantans when it comes to [insert conversation title]. [TAG @AtlantaRegionalCommission] is looking for people across the Atlanta region to host a Civic Dinner on exciting topics spanning from Mobility to Affordable Housing. You'll join a movement of hundreds of conversations that will help ARC and all our regional partners understand what matters to real metro Atlantans as we begin the work of updating The Atlanta Region's Plan, the blueprint for the future of metro Atlanta. Getting started is easy. Just sign up to host, select a location (your house or quiet restaurant), invite a diverse group of friends and neighbors, and download the step-by-step Host Guide that includes everything else you'll need. I'm hosting a Civic Dinner on [insert conversation title] on [insert date and time] at [awesome location of your Civic Dinner] and would love it if you could make it! This isn't just any dinner. This conversation is one of hundreds happening across the Atlanta region. With these dinners, ARC is giving metro Atlanta residents the opportunity to sit down together and break bread while having focused, meaningful conversations about issues that matter. Your input will help ARC and all our regional partners understand what matters to real metro Atlantans as we begin the work of updating The Atlanta Region's Plan, our blueprint for the future of metro Atlanta. You can anticipate some good food and good company, and some really meaningful and important conversation around how we can help plan for the future of ATL. Save and share image for the conversation you are hosting at your dinner. I'm hosting a Civic Dinner on behalf of [TAG @PlanAtlanta]! Join me [insert date and time] for a night of meaningful and important conversations exploring what matters to real metro Atlantans when it comes to [insert conversation title]. [TAG @PlanAtlanta] is looking for leaders across the Atlanta region to host a Civic Dinner on exciting topics spanning from Mobility to Affordable Housing. You'll join a movement of hundreds of conversations that will help ARC and all our regional partners understand what matters to real metro Atlantans as we begin the work of updating The Atlanta Region's Plan, the blueprint for the future of metro Atlanta. [TAG @AtlantaRegionalCommision] is looking for people across the Atlanta region to host a Civic Dinner on exciting topics spanning from Mobility to Affordable Housing. You'll join a movement of hundreds of conversations that will help ARC and all our regional partners understand what matters to real metro Atlantans as we begin the work of updating The Atlanta Region's Plan, the blueprint for the future of metro Atlanta.